Animated comedy in which three friends on the Kiwi island of Ngaro set out to investigate all of the island's secrets. With the voice talent of Rhys Darby, Temuera Morrison and Leigh Hart. When Mayor Dennis Gobb runs for re-election, he finds himself running against a mysterious new politician who the Bandits suspect may be hiding a dark secret. The legend of the Ghost Dinghy is well-known on Ngaro, so when the ghost of Captain Cragglechin shows up, Tane, Fridge and Riley are delighted to find out that the stories are true. Mayor Dennis Gobb's budgie has been stolen and the Bandits are determined to find the culprits. A toxic fertiliser turns the vegetables on Ngaro into zombies and the Barefoot Bandits must team up with Mr Slab to take them down. 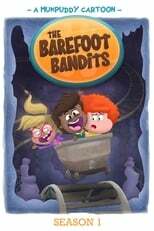 The Barefoot Bandits discover the entrance to a strange underground world inhabited by an unusual race of creatures. The Barefoot Bandits make a historic discovery, and they must do everything in their power to protect it. The real Tumeke Space comes to Ngaro Island for a convention and the Barefoot Bandits take him on an adventure he'll never forget.